Cheese overdose! We’re deeply grateful for this anonymous homemade Brie cheesegift from our subscriber from UK. This time we will make beautiful and delicious vegetarian dish made with cheese and baked in pastry. Everything is made in the beautiful forest near the calming running water. 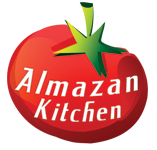 AlmazanKitchen wants to show you that you don’t need full setup of tools to make something really tasty, everything you need can be easily found around you! This dish is full of fats, proteins and carbs – balanced list of macronutrients that you need for your healthy life! We didn’t also forget about micronutrients – freshest cucumber, Balkan pepper and handful of juicy tomatoes! Mix 1 cup of flour with water, 1tsp. of yeast, sugar and salt. Knead well and form a ball. Leave to rest for a while. Slice cucumber and Balkan pepper also remove the seeds. Flatten out and attenuate the dough, coat 3 Brie cheese small rounds with dough, wrap it around like we did in the video.